Clients often present with complex diagnoses that require multiple short-term and long-term dietary changes. These diagnoses may include type 2 diabetes, CVD, lactose intolerance, celiac disease, nonceliac gluten sensitivity, inflammatory bowel disease, and other gastrointestinal (GI) discomfort caused by FODMAPs (fermentable oligo, di-, monosaccharides, and polyols). While an appointment with a clinical or consultant dietitian can yield diet and nutrition advice, clients may require additional assistance with food shopping to translate their diet prescriptions into meals and menu planning. "Things that make sense in the comfort of a private office can suddenly become unclear when a shopper is in the supermarket," says Allison Stowell, MS, RD, CDN, a dietitian at Hannaford Supermarket, in Pawling, New York. This article discusses five real-life cases, each presented hypothetically to a supermarket dietitian, who offers guidance to the client as if he or she were a shopper seeking the assistance of a supermarket dietitian in store. Nancy, a 15-year-old ninth-grade student with celiac disease and lactose intolerance, received nutrition counseling from Angela Lemond, RDN, CSP, LD, of Lemond Nutrition in Plano, Texas. "Nancy had been following a gluten-free, lactose-free diet and came to me with complaints of gas, bloating, and diarrhea, along with vomiting almost daily," Lemond recalls. "When I first saw her, she weighed 163 lbs, having recently lost 15 lbs because of her symptoms. "Nancy's mother, who shops and cooks for the family, described Nancy as a very picky eater who does not like most fruits or vegetables. Her typical daily diet included gluten-free toast, a turkey sandwich and chips for lunch, a clementine or apple, and grilled chicken or beef tacos for dinner. "I placed Nancy on a strict low-FODMAP diet for one week, followed by instructions for adding high-FODMAP foods back into her diet. I also provided written FODMAP materials, suggestions for low-FODMAP and shopping apps, and general IBS diet information. "I would like a supermarket RD to reinforce information on FODMAPs in foods and help Nancy's mom plan for food reintroduction." Stowell, at Hannaford Supermarkets, offers the following guidance to Nancy and her mother. "While the produce department and center aisles are important, every section of the market has foods that can or shouldn't be consumed on a low-FODMAP diet. As we visit each aisle, we will add to the shopping list of low-FODMAP foods Nancy likes to eat and tolerates. One of the best parts of shopping with a retail dietitian is that Nancy and her mom can try foods before buying them. For her mom, understanding the label and ingredient list is critical. A probiotic, along with fermented foods, may help restore Nancy's gut bacteria. "I would advise Nancy's mom to come back during our store's weekly nutrition demonstrations to follow up, take another tour, and get additional meal planning ideas as Nancy's diet is liberalized. Periodic follow-up as Nancy progresses through different diet goals will address her changing needs and any new goals or guidance that Angela offers." Peter, a 20-year-old male collegiate football player, was recently diagnosed with Crohn's disease and was following a high-protein diet. Leslie J. Bonci, MPH, RD, CSSD, LDN, owner of Active Eating Advice, a nutrition consulting company in Pittsburgh, provided Peter with nutrition counseling. "Peter was referred to me to help manage his symptoms of diarrhea and bloating," Bonci says. "He has a long history of GI distress, diarrhea, pain, bloating, and some nausea. Before his Crohn's diagnosis, Peter consumed lots of fried foods, dairy products, carbonated beverages, and sugary snacks. His weight is down 20 lbs after recent flare ups, and he says he feels sapped of strength. "Peter lives in an apartment off campus and does not know how to cook. He eats meals at the training table during the season, tends to skip meals on weekends, does not have a lot of money to spend on food, and buys lower-cost items like fast food and chips. "I instructed him to follow a diet high in protein, low in sugar, lactose-free, low-fat, and low in fiber, with smaller, more frequent, nutrient-dense meals. Foods to restore weight and muscle mass include lower-cost protein foods; higher protein, dairy-free alternatives such as soy, pea, or peanut milk; low-lactose products; nuts, nut butters, and seeds; lower-cost, easily digested carbohydrates; and ingredients to increase calories in beverages. "I would like a supermarket RD to educate Peter on higher-protein, lower-cost choices within his allowed foods, and on the use of texturized vegetable protein to add protein without the fat and at a low price point." Matthew Whipple, RDN, LDN, a retail dietitian at ShopRite of Whitman Plaza in Philadelphia, would offer Peter the following guidance: "My goal would be to help Peter expand his diet safely with variety and optimal nutrition while keeping in mind cost and convenience. "A shopping list will help Peter stay organized and get the food he needs for the week. He can use free smartphone apps to keep a running list. The ShopRite app will allow him to access the weekly circular and digital coupons for saving time and money. ShopRite's premium private-label Wholesome Pantry brand does not cost more and may even be cheaper than brand name items. "Peter should start in the produce section, where foods have the highest nutrient density, and shop for colorful, seasonal items to save money. Fruits and veggies that are suitable for slicing and bagging make great snacks. It's important for Peter to try one new fruit or vegetable at a time to make sure he tolerates it. A 100% fruit juice can be a good low-fiber option for people with symptoms of Crohn's disease. "Protein sources can include low-fat, lactose-free milk or unsweetened plant-based milks like soy, almond, or cashew. Greek yogurt is lower in lactose and higher in protein. Nut and seed butters are low-cost and work great on sandwiches and as a quick high-protein snack. Powdered peanut butter works well in smoothies. Textured vegetable protein and soy crumbles can be added to a pasta sauce for extra protein. Eggs are among the most affordable protein foods, and they are easy to cook. "In the grain section, pasta made with added veggies like spinach powder or tomato powder provides a wider array of nutrients. Peter can buy a bag or box of rice and make enough for the week. Bread wraps are a versatile option for breakfast, lunches, quesadillas, and roll-ups." Barbara, a single 26-year-old clerical receptionist, actress, and student, presented with bloating, constipation, and food sensitivities. She was previously diagnosed with small intestinal bacterial overgrowth (SIBO) and received nutrition counseling from Alicia Galvin, MEd, RD, LD, CLT, in Dallas. "When I first saw Barbara, she had a history of severe constipation and laxative use and had been diagnosed with irritable bowel syndrome and SIBO (by lactulose breath test). Barbara has been on and off antibiotics for SIBO and urinary tract infections. Colonoscopy, endoscopy, blood tests, food allergy testing, and GI tests all were normal. A recent HLA-DQ8 test for celiac disease was positive. "Barbara avoided gluten, dairy, eggs, onion and garlic, pork, caffeine, nightshades (tomatoes, potatoes, bell peppers), added sugars, plant-based proteins, bananas, peanuts, and legumes. Going gluten-free helped to mitigate her abdominal pain but not her bloating and gas. A different nutritionist placed Barbara on a low-FODMAP diet approximately six months before I saw her. "Barbara lives on her own and does her own grocery shopping and cooking. I reinforced the principles of a low-FODMAP diet, to be followed for another month, with additional elimination of nuts, seeds, grains, soy, eggs, and dried fruit. I instructed her to reintroduce one high-FODMAP food at dinner, add back nightshades, and have two daily servings of fresh fruit. "I would like the supermarket RD to help Barbara find minimally processed foods with simple ingredients that meet her current restrictions, including convenience-type items for her busy schedule." Jennifer Blaser, RD, LD, a supermarket dietitian at Valley West Hy-Vee in West Des Moines, Iowa says, "We would start in Hy-Vee's FODMAP section and gluten-free food aisles with a quick review of what to look for on the label. From there we would go through the other areas of the store, with emphasis on foods that are quick and easy to prepare and fit into easy meal planning for Barbara's lifestyle. The perimeter of the store—produce, meat, and seafood—offers minimally processed foods that should be a focus for shoppers following a low-FODMAP diet because they simplify the diet and label reading. The Hy-Vee HealthMarket department offers a wide variety of packaged items, including the FODMAPPED for You and FODY food lines. Both have items that can make life much easier, such as sauces, dry soup bases, and spices. On conventional items, the words "natural flavors" or "spices" should be avoided unless the item specifically states FODMAP friendly, as these can be sources of gluten, onion, and garlic. "Writing out meal options for the week, looking through store ads and coupons, and making a grocery list before getting to the store will help Barbara stay on budget, while still having a little extra money for some of the pricier FODMAP convenience items. The app FastFODMAP includes a search feature for FODMAP foods, knowledge games, and a diary of foods, activities, and moods. Hy-Vee Aisles Online, an online grocery ordering and delivery service accessible through the Hy-Vee website, simplifies shopping and saves time. Hy-Vee's free store tours with a dietitian are very informal, can answer questions, and can help Barbara locate FODMAP-friendly items in the store. "A follow-up visit will help Barbara reintroduce foods back in to her diet as appropriate and broaden her food and meal options." Cassie, a 63-year-old life coach and dietitian with food intolerances, follows a lactose-free diet. She explains her dilemma to me, the author of this article. "I first developed extreme fatigue in early 2017 and suspected I had food allergies. I tried two different elimination diets following the suggestion of a naturopath, with no improvement. I then visited my physician, who diagnosed me with depression ('like all women your age') and prescribed an antidepressant. I disagreed with the diagnosis. "A colleague recommended LEAP (Lifestyle Eating and Performance) testing several years earlier, but I had resisted because of the cost. I changed my mind when I became frustrated with the lack of a diagnosis and underwent LEAP and saliva cortisol testing as recommended by my naturopath. I was diagnosed with adrenal fatigue stage 3, reactivity to caffeine, saccharine, cow's milk, and vanilla, and moderate reactivity to certain fruits, vegetables, plant and animal proteins, and food additives. I worked with a dietitian, who provided me with a five-phase, four-week food introduction plan. "Currently I eat eggs, meat, salads, vegetables, nuts, and dried fruit. I avoid certain fruits and vegetables and have dairy only sparingly. "I would like a supermarket RD to make sure I am choosing balanced, sensible foods." Stephanie Chelton, RDN, retail clinical dietitian at Kroger/The Little Clinic in Farragut, Tennessee, says that "Because Cassie has a plan from another dietitian, a 30-minute personal shopping session will help her navigate the aisles efficiently and find products to support her goals. First stops will be the produce and meat and seafood departments. Kroger's Easy for You Seafood service provides optional free seasonings and ready-to-cook packaging for fresh seafood. "Since Cassie mentioned concern about cost, bulk foods may be a cost-effective option for the grains and nuts and seeds on her plan. Some of the foods on her list can be found in multiple forms throughout the store. These products could help her think outside the box and keep her diet more varied while providing options to simplify meal preparation, for example, whole and preshredded zucchini in produce and zucchini spirals in the frozen section, and fresh, frozen, and freeze-dried mango. The frozen section provides convenient whole food items that can meet her diet needs and limit food waste. "A blank grocery list rather than a set list of foods will enable Cassie to take notes during her session. The Kroger app enables her to make a shopping list in advance, with the aisle numbers noted to make her trip to the grocery store quick and efficient. It can also help her identify sale items and find any available digital coupons for the foods on her list." Ronald, a 59-year-old house painter with type 2 diabetes, is following a vegan diet. He received nutrition counseling from Lisa Stollman, MA, RDN, CDE, CDN, owner of Lisa Stollman Nutrition, a food and nutrition consultancy in Huntington, New York. "Ronald has been following a plant-based, mostly vegan, 1,800- to 2,000-calorie diet for four months. Previously, he had six to eight eggs daily for breakfast and either chicken or red meat at lunch and dinner, limiting carbohydrates out of concern about his blood glucose. He has started to eat more fruit, beans, and whole grains and takes a vitamin B12 supplement. Ronald has lost 90 lbs since his diagnosis four years ago, and his hemoglobin A1c has been going down. "Ronald does all of his shopping and cooking. Healthful eating is so important to him that he shops at three different stores weekly to get the food that he enjoys at the lowest prices. He cooks his vegan meals for the week on Sundays. "I would like the supermarket RD to help Ronald find healthful, budget-friendly vegan protein sources, as well as additional whole grains that he may not be familiar with, and show him how to incorporate these foods into his diet." Andrea M. Barnes, MS, RD, LDN, FAND, an in-store dietitian at Weis Markets, Inc in Allentown, Pennsylvania, says, "A personalized shopping experience with a focus on Weis Market's new Plant-Powered Eating program will help Ronald manage his diabetes on a vegan diet. Weis Markets now offers the new 'Simple Guide to Plant-Powered Eating' brochure, with tips for incorporating plant-based diet staples into meal planning, including simple swaps and grocery guides to highlight nutritious and budget-friendly, plant-based foods throughout the store. We've also identified 'plant-powered' items through shelf tags on both store and national brands of fresh and frozen vegetarian and vegan products. "The produce section provides a good foundation, with numerous high-fiber fruits and vegetables. Fresh herbs infuse additional flavor into foods without adding salt or sweeteners. Ronald also should consider frozen fruits and vegetables since they're picked at the peak of freshness, are available without added sugars or salt, and are budget friendly. "To help manage his diabetes, Ronald can expand his food choices with high-fiber grains and a variety of nuts and seeds, which he can find in their own aisles in the store. Beans and legumes are packed with fiber and protein and make excellent meat substitutes." Other in-store resources include the Weis NutriFacts program of colorful shelf icons that identify foods that are vegan, whole grain, high in fiber, or lower in carbs, Barnes adds. And the Weis website, HealthyBites magazine, and consultations and tours with the store dietitian are all free of charge. Supermarket RDs can be an important resource for clients with various food sensitivities, intolerances, and chronic diseases, and the nutrition professionals who counsel them. 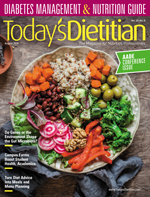 Stronger connections between dietitian consultants and supermarket RDs can help turn dietary instructions into practical meal planning, recipes, and shopping experiences to achieve better health. — Mindy Hermann, MBA, RDN, is a New York-based food and nutrition writer and consultant who was inspired to explore the synergies between consultant and supermarket dietitians after shopping inefficiently for a client with multiple food restrictions.